John Wayne's monumental film career spanned six decades. He appeared in more than 170 films and for an entire generation, he was Hollywood's biggest and most durable box-office star. This limited edition of 2,500 framed FilmCell presentation, shows The Duke astride his horse in full cavalry regalia. 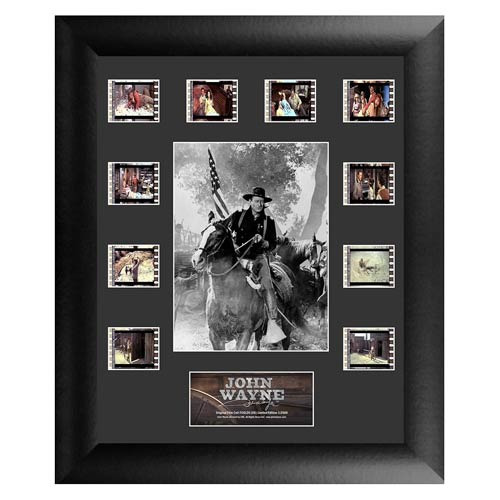 Bring home a true classic with this official John Wayne collectible that boasts 10 clips of real film from his movies! 13-inch x 11-inch black MDF frame. Real film from John Wayne movies! Comes with an easel back for easy display. Trend Setters embossed/foiled certificate of authenticity.